Could 3 of the NHL's Original Six advance to their respective conference finals? Either Crosby or Ovechkin won't be headed to the NHL's version of the final four but who cares? Who cares if the NHL broadcasts their playoff games on an obscure cable network? Above all that, the National Hockey League has the opportunity to put as many as half of their cornerstone franchises on the games biggest stage, front and center. 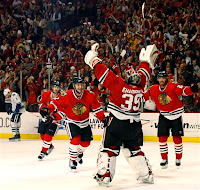 The Chicago Blackhawks, for the first time in fourteen years will be four steps from the Stanley Cup finals. It took a team with more youth than the cast of Gossip Girl (yep, that's a Gossip Girl reference), beating one of the games elite goalies to punch that proverbial ticket. The Blackhawks are littered with young talent and backed by a fan base second to few. The Chicago faithful filled the United Center, prepared as the Canucks were on the playoff brink, with an excitement and rush that she hadn't seen since the Jordan years. It may have taken the Blackhawks four third period goals to bury the final Canadian representative in the 2009 cup playoffs, but they did it and their stars didn't fail to show up. Led by their 20-year old right wing Patrick Kane, and 21-year old captain Jonathan Toews, the Blackhawks stormed Canuck goalie, Roberto Luongo with 3 goals in less than four minutes to open the third period. While the fans look to Kid Crosby and Alex The Great, they better not be sleeping on Patrick Kane, whose game 6 hat trick lifted his team to the conference finals. All the kids aside, if the Blackhawks want to bring the cup back to Chicago, they'll need the 12-year veteran, Nikolai Khabibulin to be on his (A) game. Khabibulin has a GAA against of 2.68 against Detroit, a possible conference finals opponent. The NHL and its fans are in for a treat with Chicago's fans rabid for playoff hockey and the Blackhawk players who are hitting their full stride at the right time. The Detroit Red Wings are on the cusp of the conference finals, their title defense still intact. After the Red Wings defeated Anaheim in game 5, it was back to the West Coast to punch their ticket to the round of four. A 10:00 start time on the East Coast and we'll find out if the Wings can join their Original Six mates, Chicago, in the conference finals. Getting after it, the Red Wings went from down 2-1 to up 3-2 in just days and they don't see to be stopping. 10 goals combined in games 4 & 5 including goals from stars Henrik Zetterberg, Marian Hossa, and Johan Franzen. The Red Wings offense has simply turned the once hottest goaltender in the playoffs, Jonas Hiller, into a guy letting up five+ goals a game. However, if the Wings want to advance past a tough veteran Ducks squad and further they'll need to get more out of center Pavel Datsyuk. Datsyuk finished the regular season with 97 total points, good for fourth in the entire league behind only Malkin, Ovechkin, and Crosby. In the postseason however it has been a different story for the Red Wings star, he's only recorded 4 points and only 1 goal. Our advice to the Red Wings, the best way to defend a title is to not allow the Ducks to push a game 7, especially not against Jonas Hiller. Down 3-1, the Boston Bruins dropped 4 goals on Carolina and their Vezina Trophy finalist, Tim Thomas, reverted to his regular season dominance. Make no bones about it, the Bruins aren't out of the forest yet and their biggest challenge comes tonight. Boston got punched in the mouth throughout games 2, 3, and 4, then in game 5 Carolina Hurricanes forward Scott Walker decided to do it literally at the expense of Aaron Ward's face. Here's my advice to the Bruins, put that on the shelf and get him back in the coming season, take care of business in Carolina and bring this series back to the beast that is Bruins Country. If the Bruins want to continue their cup quest it has to be on the pads of Tim Thomas. Thomas played awful in the Bruins three losses allowing 10 goals and was unable to put together consecutive periods of good play. It's no secret that the Bruins are where they are because of their defense and combined goaltending. Their offense will have to come from 21-year old Phil Kessel among others. In games which Kessel lights up the lamp the Bruins are 4-0 this postseason, in games which he fails to do so the B's are just 2-3. If Boston brings this game back north the Hurricanes have more to worry about than just the Bruins faithful roaring in the garden. Expect captain Zdeno Chara and or enforcer Milan Lucic to remind Scott Walker that gloves come off first. Word to the wise; If the NHL wants to remain on the forefront of professional sports you need be cheering for the Bruins, Wings, and Blackhawks because paired with either Ovechkin or Crosby, we're in for one helluva final four.